Andrew Darqui cool article. 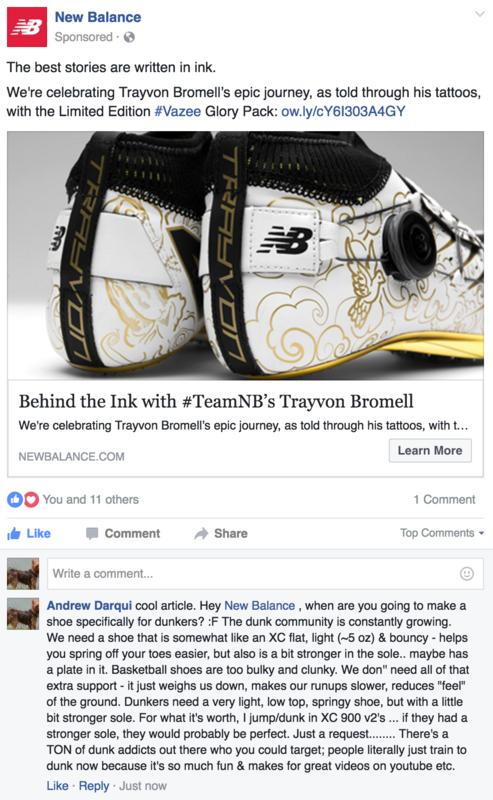 Hey New Balance , when are you going to make a shoe specifically for dunkers? :F The dunk community is constantly growing. We need a shoe that is somewhat like an XC flat, light (~5 oz) & bouncy - helps you spring off your toes easier, but also is a bit stronger in the sole.. maybe has a plate in it. Basketball shoes are too bulky and clunky. We don'' need all of that extra support - it just weighs us down, makes our runups slower, reduces "feel" of the ground. Dunkers need a very light, low top, springy shoe, but with a little bit stronger sole. For what it's worth, I jump/dunk in XC 900 v2's ... if they had a stronger sole, they would probably be perfect. Just a request........ There's a TON of dunk addicts out there who you could target; people literally just train to dunk now because it's so much fun & makes for great videos on youtube etc. i know i've said it before but IMHO lotto quaranta is currently the best substitute. they're 7.7 ounces -- not quite 5 but still a lot lighter than any other tennis or bball shoe i've ever seen -- have flat and wide soles and are reasonably stiff. not saying a dunk-specific shoe wouldn't be better but quarantas aren't bad. and they're cheap, ~$40. Bro, APL already made the perfect dunking shoe! Can't believe how many lines they have though, not only bball shoes but running as well. Such a crowded space. I'm actually pretty happy with my Kobe's they're not heavy at all and lowtop, comparable to my running shoes .. the only problem is, and this is a deal breaker ... is that they're not flexible on the top so i dont get much dorsiflexion (?). if i can find a pair of shoes that have that as well i'll be super happy for a dunking shoe (and general basketball). yo! do you put insoles in them? Both of the pair I bought, the soles ripped out within a week.. and they were this weird cushion material. I didn't like the "normal pair" too much .. but, maybe that's just because I liked the other pair I bought which was made out of that new bouncier material. I forget the name of it. I never jumped in them.. not sure if i'd enjoy SLRVJ'n in them from what I remember.. DLRVJ would have felt good I imagine. i've never had kobe's.. and i'm still tempted. I think I need to get a stronger shoe for MAX EFFORT slrvj... i can submax in my flats but, max effort, might be risking it a bit.. I just don't want to F up my heel. haven't used inserts but the soles have been totally fine for me. dunno. Neither, it's my first pair and i normally wudnt get a name shoe, just dont care about that stuff. KDs stuff looked good to me but i cant be bothered paying the premium for a name. Anyway about the Kobes, i didn't get the highend pair Kobe 12 or whatever they're up to now. But i do wanna know if theyre better in the regard of flexibility up top. Lemme know if you find a good pair - i think Kobe's are close if only for the inflexibilty up top. I jump in Puma biowebs. I had a deal with them where I got them for nothing and I have 30 pairs. They are in all my dunk videos. Highly recommended. Wow it must have been some deal. i have the kobe 9's and i don't think i can find a better shoe for dunking indoors than them. they're low to the ground and flat, so they're not like typical basketball shoes where theres too much cushion and it becomes cumbersome for jumping. also the traction on them is literally GOAT lol. i also had the nike zoom streak lt 2's which have really thin cushion. on court theres barely anything separating you from the ground. the traction on them inside wasn't too good though, but if they did have good traction i would've ordered more pairs. i used them outdoors instead and the traction is completely worn out now. i really like shoes with thin cushion though. might be a placebo, but i feel like i jump higher in them. you really get to transfer that energy straight into the ground instead of having soft cushioning absorb it. also cool how you can pass for a shorter height without wearing shoes with really thick cushion. my height without shoes is in between 5'11 and 6 ft, so i can pass for 5'11 in my zoom streak lt's and be a sub 6 ft dunker lol. i'm like 6/6'1 in my kobe's though, and 6'2 in my kd 7's. i really need to find a place locally that has some kobe's to try on.. i've stopped by some stores occasionally to see if they had them, and they never had any in stock. you'll probably only find kobe 11's at stores now. there's 2 versions, the elite and the EM. i read a lot of reviews, and apparently the elite's traction is trash, while the EM's traction is better, but still not close to kobe 9 level. think i'm gonna get the nike zoom streak lt 3's next. hope the cushion is as thin as the 2's so i can pass as 5'11 again lol. Damn andrew you got me looking for the perfect shoe too. haha. My cursory research suggests that the higher end Kobe shoes possibly weigh more than the budget ones (eg kobe mentality 2). So now im thinking why would i pay more for a heavier shoe? But the problem is there is no standardized way of checking weights .. and all im going by is reviews which means it's subject to error in measurement and also depending on the size of the pair the reviewer used. So it's almost useless. I hate that shoe reviewers are universally retarded and get caught up in the jargon so much so that they forget to actually say something objectively true about the shoe lol. in my exp. the shoe weight makes no difference lol. unless you were wearing something as heavy as hiking boots thats when it counts, but all ball shoes weigh about the same, i guess the only difference is the placebo a light shoe would give you lol.